Sillem Srl has a long history of designing and manufacturing automated plants for finishing, polishing, grinding, degreasing, and washing of metal parts. Particularly successful results were achieved in the production of plants for the stainless steel household goods industry; 60% of stainless steel cookware presently produced worldwide are finished on Sillem’s plants. More than 3,700 customers in 36 countries around the world attest to the quality of the products and services provided in over 65 years of activity. The present range of our plants, thanks to the experience gained in over 60 years of presence in the market, can solve most of the problems proposed by the customers. However, the rapid market evolution drives us to continue our research aimed at finding new solutions, often developed through synergy with the user. Reliability, Quality and Ease of Use are the factors that give Sillem Srl commercial success in all markets in the world. Sillem’s plants vary in size according to the production requirements and provide customized solutions capable of meeting the different requirements of the industry, from traditional machines to the automated lines composed of several integrated plants, through robotized units and computerized production control systems utilizing servo controls. 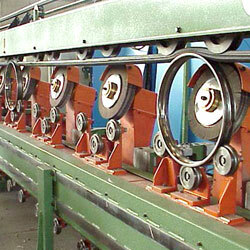 Special emphasis is placed on reducing downtime. The time needed for tool change, set-up, programming and movement is being constantly improved. Innovative solutions and the introduction of electronic and computer technologies led to greater control and a reduction of downtime. Additional elements, such as loading/unloading units and automatic manipulators can ensure a continuous operation of processing lines composed of several machines with minimum operators required for supervision and ordinary maintenance operations.